When I portray Dr. Franklin, people frequently ask about inventions. “ What are you inventing today?” or “How many inventions have you done?” I usually respond as Franklin did when someone referred to his inventions. He did not call them inventions. He called them his improvements. Indeed, they were almost always improvements, as most inventions are. He did not invent eyeglasses, but he improved them with the bifocal lens. He did not invent the fireplace, but he improved it with his Pennsylvania Fireplace, which evolved into the Franklin Stove. Benjamin Franklin’s modus operandi seemed to be, “if it doesn’t work like I want it to, I will try to make it work better.” This applied not only to those physical objects, but to social invention and improvement as well. The library, the fire company, the hospital, the secular college: these all were results of the same approach. What has fascinated me, and others over the years, is the way Franklin lived his life in that same way. When we look at entirety of his life, we see a constant reinvention, beginning with his early years. Benjamin was one of seventeen children, the youngest of the ten sons. Josiah Franklin, Benjamin’s father, was a devoutly religious man in the very religious city of Boston. He decided that young Ben should be his “tithe to God”. In the spirit of tithing, which involves giving one-tenth of one’s income or possessions to the Church, or to God, Josiah said that Benjamin would become a clergyman. In order to effect this project, he enrolled Benjamin at the age of eight in what would become the Boston Latin School. The plan was that after his studies there, he would attend Harvard College and study for the ministry. Unfortunately for Josiah, this did not happen. Though he did well in his other subjects, young Benjamin failed arithmetic. Josiah decided that he could not justify the expense of the original school, and placed him in Mr. Brown’s School, a cheaper alternative, for the second grade. What probably ended the clergyman project, though, was a larger problem. Benjamin, even at the age of nine, was already a questioning and contentious fellow. Josiah saw that he would have a brief and disastrous career in the ministry in Puritan Boston. So Benjamin Franklin managed the first of his reinventions of himself. He derailed himself from the clergy track, and assured an imminent place on the apprentice track. After the second grade, Josiah took Benjamin out of school and made him his apprentice in the family candle and soap making shop. This was typical of most young boys whose families were not particularly well off in the early eighteenth century. Those two years would be the only formal education that Benjamin Franklin would ever receive. For two years Benjamin worked alongside his father in the nasty business of candle and soap making. Most of the candles were made of tallow, the fat of animals. Soap was tallow and lye. After two years, Benjamin approached his father and asked whether there might be something different that he could do. The work was not pleasant, but he had another reason for the change. After a fourteen hour day of work, he found that he had no time left for reading. Benjamin Franklin did not want to go through life with a second grade education, and knew that he must educate himself. Josiah understood that need, and suggested that Benjamin be apprenticed to his brother, James, a printer. James agreed to take Benjamin on for a nine year period of indenture as his apprentice. And so, at the age of twelve, young Mr. Franklin reinvented himself once again, this time as a printer’s apprentice. The work in the printing office was difficult and strenuous, but Benjamin took to it immediately. He had no problem with hard work, as long as he was surrounded by books and newspapers. His education would continue. After four years, though, a new challenge arose. Benjamin began to realize that he not only loved to read, but he also loved to write. He would write pieces for his friends to read, and they gave him much encouragement. They suggested that since Franklin’s brother James published a newspaper, the New England Courant, and Benjamin was his apprentice, surely the paper would publish Benjamin’s writings. Having had his adolescent ego fueled by the praise of his friends, Benjamin approached his brother with a letter to the editor that he had written. The submission was rejected, and harshly. It became apparent that James Franklin would not publish anything written by Benjamin Franklin. Not to be denied, Benjamin wrote a new piece, signed his name Silence Dogood, and purported to be a widow In her forties, telling a tale of a difficult life raising children and providing for them. He slipped the submission under the door of the shop at night. When James found the letter, he thought it was one of the best bits of writing he had ever been given. The Silence Dogood letter was published, and there would be more. By popular demand, Franklin submitted fourteen of those letters over a six month period, and James published them all. Benjamin was now, not only a published writer, but a popular one. The only problem was that no one knew that he was the author. He told a few friends. Boston was a small community, and word got around, finally reaching James Franklin. James was not pleased. It is unfortunate that Benjamin had not yet become aware of a truth that he later published in Poor Richard’s Almanac. Although he still owed James four years on his indenture, Benjamin departed Boston and arrived in Philadelphia. He had reinvented himself once again, from apprentice to journeyman printer. Benjamin Franklin found work in Philadelphia, even owning his own print shop and newspaper while still in his twenties. He began to align himself with a group of other young tradesmen, and they formed a group called the Junto. They would meet to discuss everything, politics, religion, etc. The most important thing they began to focus on, though, was the condition of their young city, Philadelphia. They had great plans for their businesses and their families, and realized that their city needed much improvement to accommodate those plans. They set about to establish a public library, a public hospital and a fire company. Benjamin always emerged as the leader of the group, the one who could get things done. The streets were paved and lit, a police force was established. Benjamin Franklin had reinvented himself once again, this time as a civic leader. He would soon parlay this experience into another area, politics. He became a councilman, then a colonial assemblyman. Along the way, Franklin had established himself as not only a printer, but a successful publisher. He published a newspaper, the Pennsylvania Gazette. He published Poor Richard’s Almanac. He had reinvented himself as a prominent businessman. He was prosperous. But he began to be distracted by a new curiosity, a new passion. He was fascinated by electricity. His innate curiosity had taken him in many directions before, but this pursuit became all-consuming. 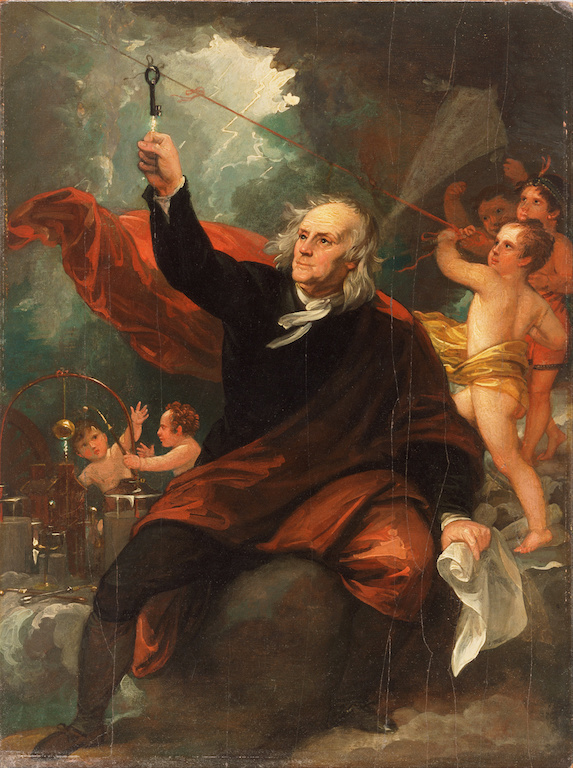 Benjamin Franklin saw electricity as more than the parlor game that people were playing, but as a basic science. He wanted to study this science, but needed time to do so. At the age of forty-two, Benjamin Franklin franchised his printing business to others, shrewdly taking a percentage of the profits in exchange for providing training and equipment, and left the day-to-day work of printing to others. He was now Benjamin Franklin, Natural Philosopher, the eighteenth century term of Scientist. Benjamin Franklin was not a trained scientist. He lacked the education and theoretical foundation of men like Isaac Newton. Franklin was intuitive and practical. His innate curiosity guided his experiments, and he began to discover basic properties of electricity. He published his findings in America and in Europe, and achieved wide-spread fame. The second-grade dropout was given academic degrees from St. Andrews in Scotland, Oxford and Cambridge in England, and Harvard, Yale and William and Mary in America. This notoriety would soon lead to another reinvention, Benjamin Franklin, Diplomat. Franklin and others in the colony of Pennsylvania had long complained about the treatment that the colony had gotten from Great Britain. William Penn had established the colony, and had outlined a great vision for Pennsylvania. Penn, however, would live only four years of his life in America, and his children inherited the colony. These younger Penn’s lacked their father’s commitment to the colony, moving to England and leaving caretakers in place. They paid no taxes on their vast Pennsylvania holdings, and provided no funding for defense from the Natives and the French on the frontier. 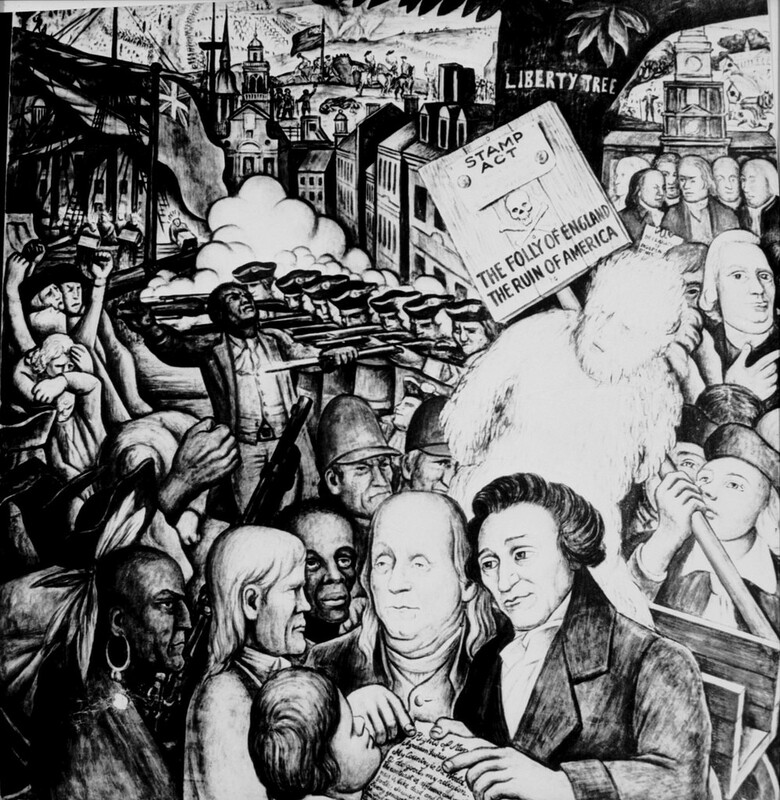 The Pennsylvania Assembly sent Franklin to London to attempt to get the Penn family charter for Pennsylvania revoked. Franklin’s tenure in London, which lasted for over fifteen years, would ultimately be unsuccessful in reversing the British policies, although there were many sympathetic members of the Parliament. His experience there, though, would prove valuable for his next diplomatic assignment. After Independence was declared, the Continental Congress knew that the American states could not defeat the British without assistance from another European power. Benjamin Franklin was once again sent abroad, this time to forge an alliance between the United States and France. This alliance was eventually achieved, once the American forces actually began to win some major battles, increasing the French confidence that their efforts might be successful. Franklin returned home in 1785 to an independent United States. In 1787 he signed the U.S. Constitution. He was elected to the Supreme Executive Council of Pennsylvania, and was made President of that body. He even completed one more personal reinvention in those last years of his life. Benjamin Franklin had owned some slaves for a few years, but now he became the President of the Abolition Society. He even sent a letter to Congress in the last month of his life, asking them to consider the abolition of slavery. Benjamin Franklin, slaveholder, was now Benjamin Franklin, abolitionist. A most fitting ending to a most unique life.